According to a number of surveys, the majority of pet owners buy their pet a holiday present along with the rest of their friends, family and loved ones. But how practical or extravagant that present may be can vary from owner to owner. We sent our secret shopper, someone who has owned everything from dogs and cats to monkeys and snakes, out into the local shops to see what's out there for the furred, finned, feathered and crawling friends in our lives. Here's what they saw. For the dog or cat that has everything, secret shopper found a fantastic line of regal, royal and festive beds to rest their furry heads called Pet Tents, from The Persnickety Pet. Complete with a luxury buckwheat-hull pillow, they come in at about $100-150 dollars each. The red and white Carnival model seemed especially seasonal. 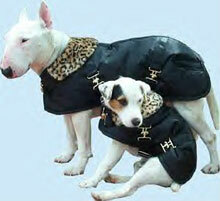 Foggy Mountain makes a gorgeous line of winter coats for the fashion-conscious canine. Secret shopper especially liked the "Monte Carlo". Our secret shopper saw them selling at a starting price of $50.00 and up. Of course, you may just want to give your dog the boot-the Harley Davidson Motorcycle Boot. For just a few bucks, your dog can look like one cool pooch. Of course, if your dogs' more of a reader than a rebel, he may want to sink his teeth into the Doggie News from the Spot brand of products from the Ethical Products Company. There's a few other fun gifts for our smaller friends, too. Sammy's Monster Turbo Cycle, from Penn-Plex runs about $15-20 dollars and will give your hamster either a stationary or roll-around work-out. Hamsteroids (like asteroids) are a scream just to look at. These little nuggets of calcium are a tasty, fun and nutritional treat. For the big bird with a big beak, nothing beats the aptly named "King Kong" clutch of colorful knots. 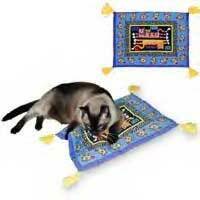 Weighing in at a whopping seven pounds, this toy looks like it will take a pecking and keep on ticking for $60.00. From Jungle Toys, which makes lots of cool bird things for small, medium and larger feathered friends. And just because he or she doesn't have fur doesn't mean they should be left out of the festivities. For the hermit crab, there's a special Hermit Crab Sea Sponge from Zoo Meds, which will supposedly help keep your little crustacean properly hydrated, and the T-Rex Cobra Mat, a toasty place for your snake or lizard friend to curl up on a long winter's night. And a present for the fish can be a present for the home, too, especially with the beauty and variety offered by the Exotic Environments line of aqua furniture from Blue Ribbon Pet. 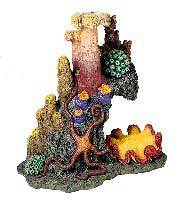 Running around $20 and up, these beautiful, reality-inspired reefs and other decorations brighten up your tank and your room. Unfortunately, not all of the city's animals will be sleeping under the tree and trying to steal the turkey from the table. Lots of little guys in places like The Center for Animal Care and Control, with facilities in all five boroughs, will be without a home. However, you can make their season a little brighter for CACC animals by participating in their Cage Comforter and Kitty Ball program. These are fun, easy projects to do while you're holed up indoors on a cold, raw winter's day. The comforters not only help ease the stress of homeless animals, they also help to ease the transition when the animals are adopted, because they take their comforters with them to their new homes. In addition, since they seem so happy lying on their little beds, they are even more irresistible and hopefully have a better chance of being adopted. The little guys at CACC especially need this extra-irresistibility. Unfortunately, as the only place in the city which takes all animals in, CACC does have to euthanize. Certainly these little guys can use all the extra help they can get in being adopted! Email the Cage Comforter Project Manager at ccp-manager@pleasebekind.com for more info. Comforters can be made from any type material except looped fabric like chenille or terry cloth that might get snagged in the animals' nails. They should be in a finished size of 11" x 18" but this can vary slightly. The comforters can be stuffed with various types of material - polyester batting, cotton batting, pieces of old blankets, etc. Cut the material to the right size. Turn inside out. Sew down each side. Turn right side out. Stuff. Sew across the bottom edge. To finish, tack down in each corner and once in the middle so that the stuffing doesn't shift during laundering. That's it! You have just created a gift of comfort for a homeless animal in desperate need. You have helped to relieve her stress in her new strange environment. You have increased her chances of adoption by helping her to relax so she can put on her best face for potential adopters. When she goes to her new home, her little bed will go with her and this little familiar item will help ease her adjustment to a million new and unfamiliar things. You have done a wonderful thing. Cage comforter too easy for you? Know your way around a knitting needle? Give these kitty balls a try. Use 4 ply wool. You can use any size hook - the smaller the hook the smaller the ball. The "I" hook works well. You will be working in rounds. You can count as you crochet, or you can mark the beginning of each round with a piece of different colored yarn. Round 2 Work six single crochets (sc) in the second chain from the hook. Round 3 Work two sc in each sc around for a total of 12 sc. Round 4 Work one sc in next sc, two sc in the following stitch. Repeat in that manner all the way around for a total of 18 sc. Round 5 Work one sc in each of next two sc's, then two sc in the following stitch. Repeat in that manner all the way around for a total of 24 sc. Rounds 6,7,8 Work even on the 24 sc. Round 9 Work one sc in each of next two sc's then decrease in the following stitch. A decrease is made by putting the hook in the next sc and drawing up a look, putting the hook in the sc after that and pulling through a look and then wrapping the yarn around the hook and pulling all three loops off the hook. Continue around in this manner for a total of 18 sc. Round 10 Work one sc in next stitch then decrease in the following stitch. Repeat in that manner all the way around for a total of 12 sc. Round 11 Decrease in each sc around for a total of 6 sc. Continue to decrease as long as you can and then finish off leaving about a 4" strand of wool. Weave the wool through the sc in the final round and pull tight like a draw string then finish off. Pull the leftover yarn into the ball so no strings are loose. The balls don't have to be exactly to these directions - if you lose count - don't worry just work your way around. If you add or decrease stitches the ball will be a little bigger or a little smaller or a little out of shape but the kitties won't mind. After you've done a few you'll get the hang of it. Other items we find useful in accomplishing a multitude of record-keeping and adoption-related tasks include: Pentium PCs, laser printers, cameras and film, and video cameras and tapes. If you or your employer can donate any of the equipment and supplies itemized above, please email us at donate@nycacc.org. Please note this address is not intended for payments; please do not email credit card information. For more information on how to donate materials or monetary gifts, fostering or sponsoring a foster animal, call the CACC at (212) 442-2076. If you haven't been by the ASPCA lately, you should check it out. Right in the front window is a magnificent "cattery " where cats waiting to be adopted perch, purr and rub their way into your heart. They need toys and people to play with them. Call the ASPCA at (212) 876-7700 to find out more. The dogs also need walking and playing with, too. The staff will train you in the ways of being a successful volunteer. In addition to cat toys, the ASPCA is asking for gifts unopened food, new or well-washed used pet beds and pillows, blankets and towels.